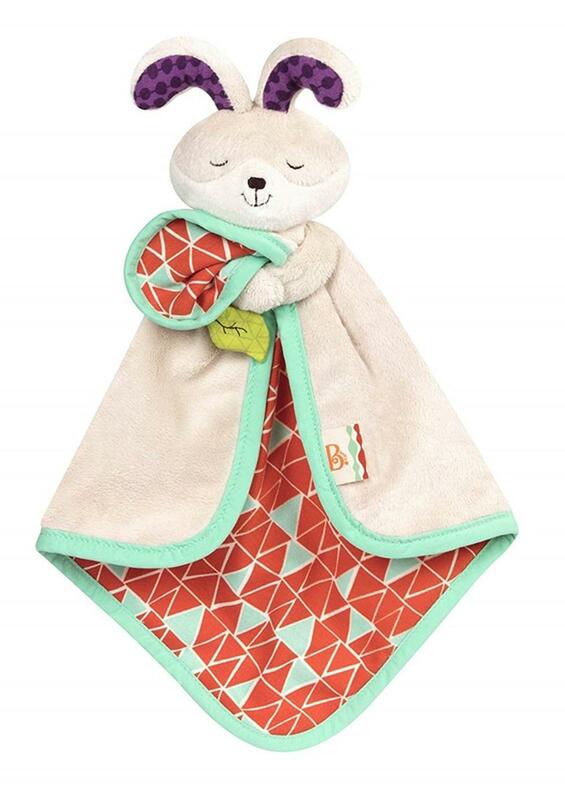 The B. Snugglies is a line of security blankets from B toys that offers comfort and reassurance. Baby can't get enough snuggles? with a name like fluffy Koko, this security blankie provides tons! designed with tiny hands in mind, fluffy koko's ears and arms are easy to grab and squeeze tight, perfect for baby to fall asleep peacefully! the fabric is incredibly soft and soothing against baby's skin. * Embroidered facial details for added security. * The green leaf crinkles softly, perfect for baby to play for a bit (perhaps even waking up to a smiling baby in the morning!!!). * Fluffy Koko provides warmth and security, but also visual, auditory and tactile stimulation. * This adorable dovey lovey blanket being from B. Toys, parents now know that they get a high-quality toy and most importantly, complete peace of mind when it comes to the materials used. * All our baby B. Items are phthalate and BPA free.